"We work with all our project partners, tenants and end users to educate them on the opportunities that informed sustainable design can unlock." Taking its place among the world’s most sustainable retail complexes, the Ponds Shopping Centre in Sydney’s north west achieved a global-first 6 Star Green Star – Retail Centre Design v1 in 2015. Frasers Property Australia (formerly Australand) has a long-standing commitment to driving improved sustainability outcomes across all its operations. A cross-sector sustainability leader, Frasers Property has specialist expertise in delivering enhanced environmental outcomes in retail, a sector typically characterised by high energy and water-use and rapid fitout churn. A world leadership Green Star rating is positive proof of this commitment. “Frasers Property Australia demonstrates that drive, determination and steadfast commitment to innovation can deliver world leadership sustainability outcomes. Frasers Property leads the way in the design and delivery of efficient, productive and sustainable retail centres,” says the GBCA’s Chief Executive Officer, Romilly Madew. “Retail centres provide an opportunity not only to reduce environmental impact but to interact with the public to educate them on green buildings through demonstration and leadership,” explains Paolo Bevilacqua, General Manager - Sustainability, Frasers Property Australia. “We work with all our project partners, tenants and end users to educate them on the opportunities that informed sustainable design can unlock, not only from the environmental perspective but also in terms of financial payback, as a means of future-proofing assets against rising utility costs,” he says. The Ponds Shopping Centre has attracted global accolades for its design, taking out the International Council of Shopping Center’s ICSC Sustainable Design Award at the ICSC 2015 Asia Pacific Shopping Center Awards in October 2015. “The Ponds Shopping Centre stands as a prime example of what is possible through a genuine, holistic commitment to sustainable design. The project has allowed us to demonstrate that 6 Star Green Star retail is not only achievable, it’s also worth doing from a financial perspective,” Paolo adds. "We understand that developing and maintaining our properties at optimal operating standard will deliver long-term sustainable value to our investors, tenants and communities – and the Green Star rating at The Ponds provides us with the positive proof we need to show investors we are making the right decisions on their behalf." While the market can be competitive when attracting tenants to new shopping centre developments, The Ponds Shopping Centre has sustainability on its side when it comes to drawing retailers. Ninety-five per cent of the centre was leased several months prior to its opening in May 2015, with business owners set to benefit from the higher rate of sales that green-rated shopping centres so often deliver. A number of international studies have demonstrated that the inclusion of green features such as daylighting in shops can lead to a vast increase in customers’ spend per square metre – up to 40 per cent in some cases. 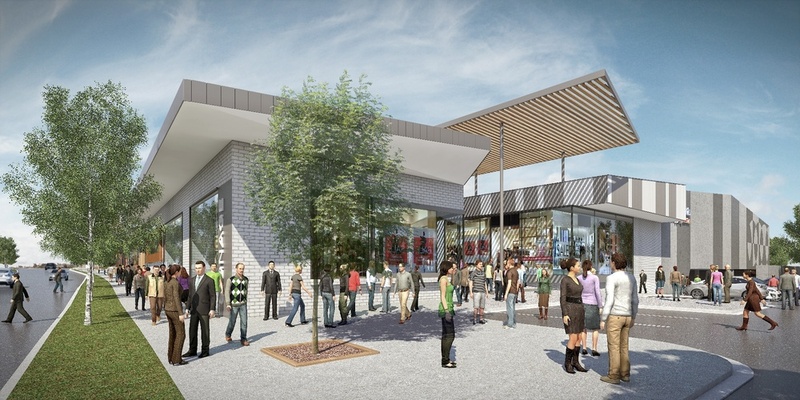 At The Ponds Shopping Centre, the north-facing outdoor alfresco space and pavilion-style shopping podium maximise the natural light penetrating into its shops and eateries. A special Tenancy Fitout Guide helps retailers to make their spaces sustainable while contributing to the efficient operation of the centre and reducing waste. Electricity and water sub-metering enable monitoring, management and ongoing adjustments to operations over time. For anchor tenant Woolworths, the emphasis on environmental sustainability can help it to meet environmental targets, reinforce its commitment to corporate social responsibility and provide a healthy workplace for staff. While the size and scale of shopping centres can make sustainability challenging to achieve, big thinking when it comes to green initiatives has made The Ponds Shopping Centre extremely efficient to operate. “Solar PV is a particular focus for all of our projects, providing clean, renewable energy in addition to a commercial benefit by reducing power costs,” Paolo explains. Four hundred PV panels top the roof of the building, providing enough renewable solar energy to power most of the car park. LED lighting in the main mall area also helps to reduce energy consumption, while much of the centre is naturally ventilated or uses efficient economy cycle air-conditioning. The Ponds Shopping Centre is designed to save water as well, with rainwater collected from the roof used to flush toilets and irrigate the gardens. Together, the sustainability measures implemented at The Ponds Shopping Centre equated to a cost of around $290,000 – less than one per cent of the project’s overall cost. This small green premium is expected to produce operational savings of $45,000 per annum. For building owner ISPT, sustainability is part of a pragmatic, long-term approach to investment. “More than 50 per cent of Australian workers have their retirement savings invested in our properties – a responsibility we don’t take lightly,” says Sam Curry, ISPT’s General Manager – Retail Services. A whole-of-building life cycle assessment (LCA) was also conducted in the design phase with results showing a 34 per cent reduction in the centre’s contribution to global warming, a 21 per cent reduction to acidification, a 28 per cent reduction to eutrophication and an eight per cent reduction in photochemical oxidation when compared to a typical reference case. “Investors and tenants are increasingly seeking green buildings which outperform in terms of the environment, asset valuation and overall operational costs and performance. Our investment in sustainability and Green Star certification at The Ponds Shopping Centre helps guarantee all of these well into the future,” Paolo concludes.